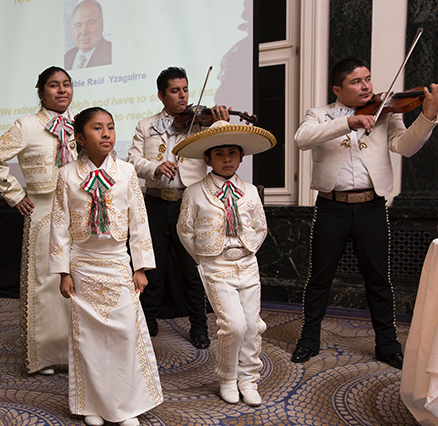 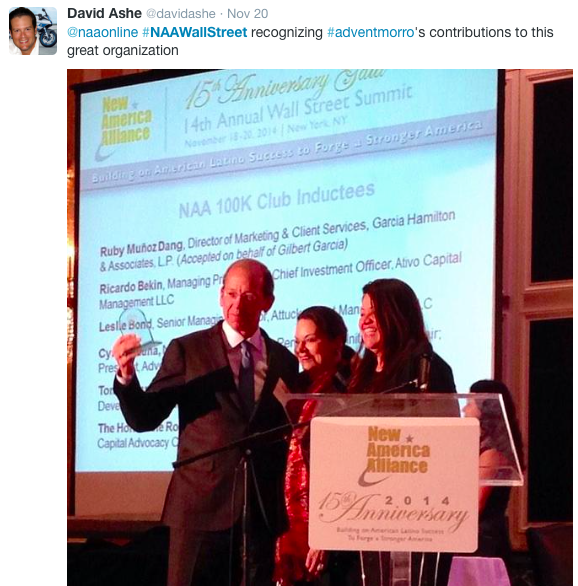 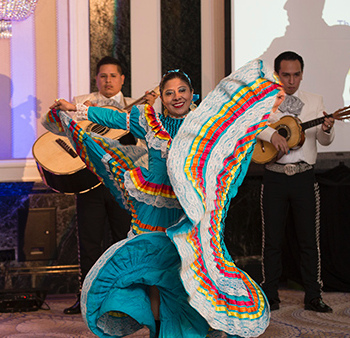 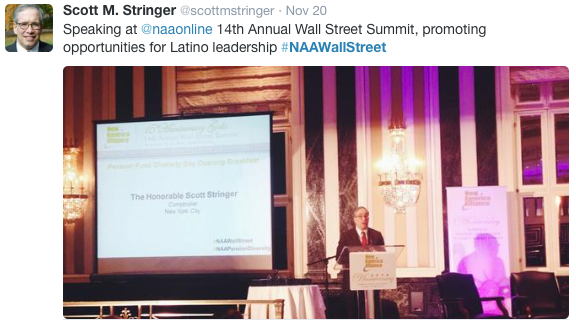 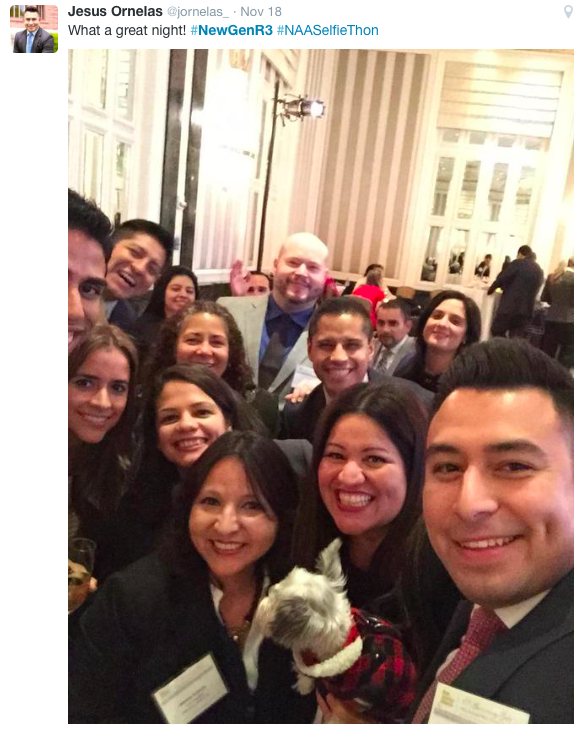 We celebrated NAA's 15th Anniversary and our trajectory of building on American Latino success to forge a stronger America at the recent NAA 14th Annual Wall Street Summit. 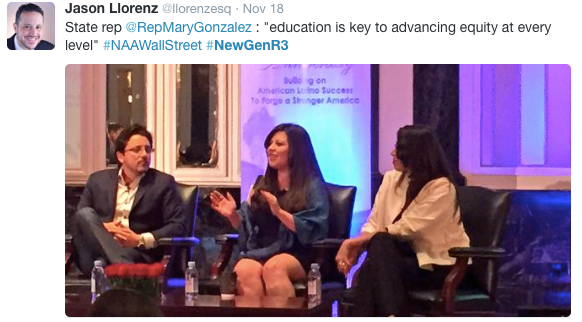 The Summit opened with the new session #NewGenR3, A New Generation of American Latino Leaders: Renovate, Remix, Rise, which focused on the rise of new Latino leaders who are redefining their pathways to success and strengthening the pipeline of new leaders moving our nation forward. 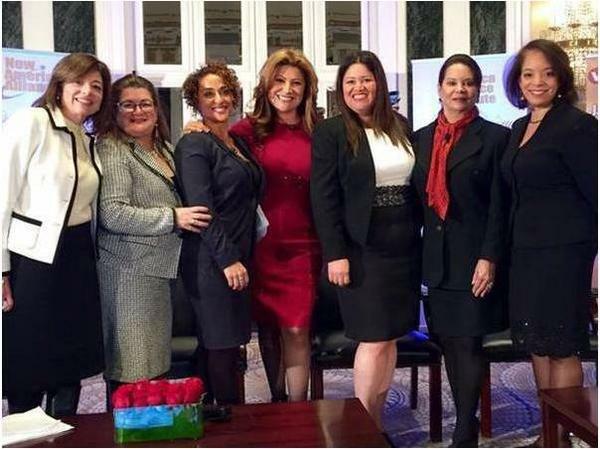 Day Two of the Wall Street Summit opened with American Latinas: Leadership and Economic Force, which gathered an illustrous group of Latinas to discuss their rise to success, highlight how Latinas are driving the economy as entrepreneurs, corporate executives and public sector leaders, and outline recommendations for continuing to elevate the leadership of Latinas across sectors. 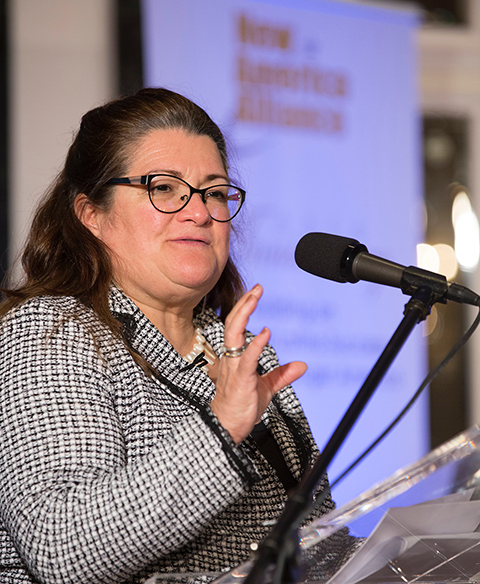 This session also marked the launch of NAA's American Latina Leadership Caucus which will aggregate 100 influential American Latinas across sectors - entrepreneurship, corporate, appointed and elected office, nonprofit and academia, with the single purpose of promoting leadership of Latinas. 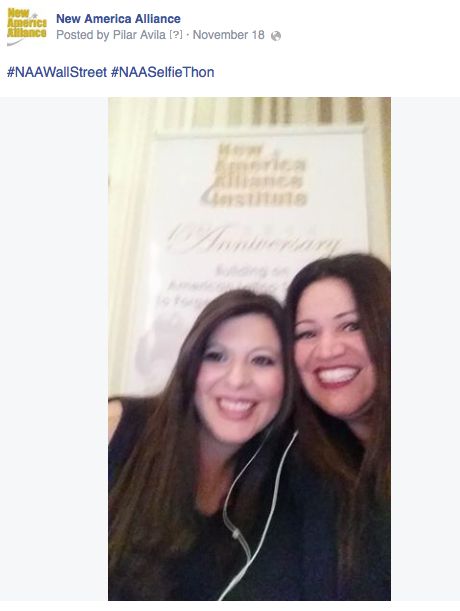 Read full Huffington Post article by NAA Institute Chair Ana-María Fernández Haar by clicking on image below. 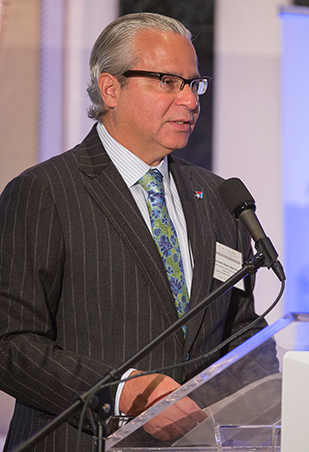 Returning to the Summit for its second year, the U.S. 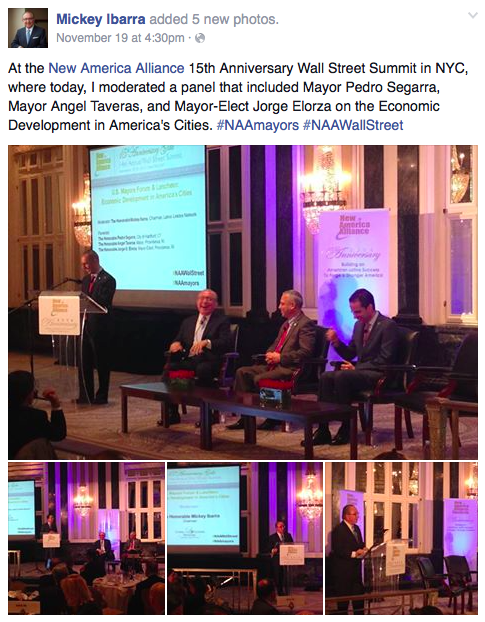 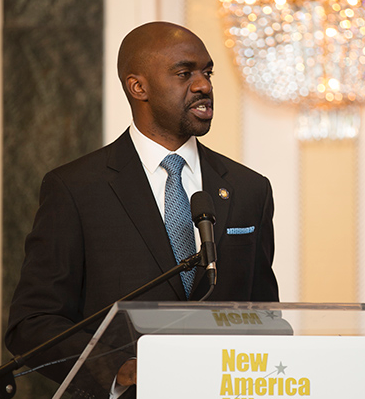 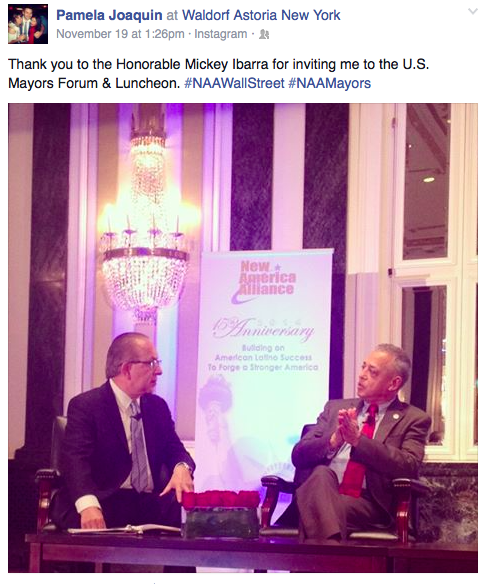 Mayors Forum & Luncheon featured insights into economic development and growth, improvement in education systems, expansion of infrastructure and community engagement across America's cities. 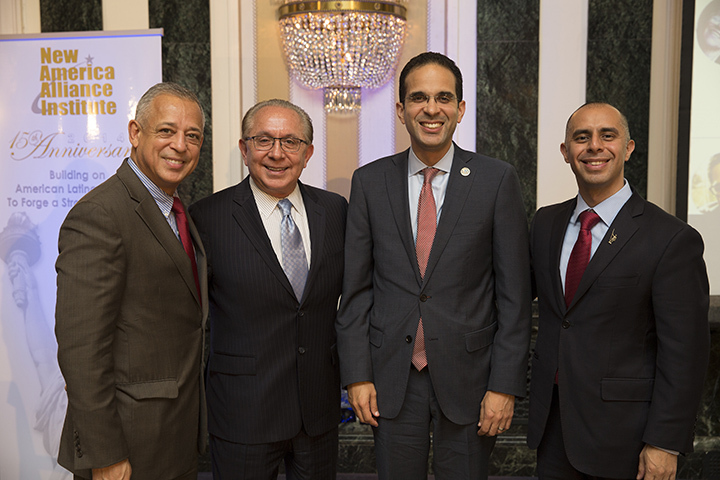 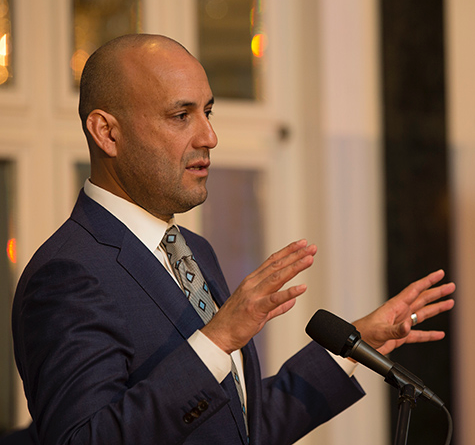 #NAAMayors Co-Sponsor Remarks: Peter R. Villegas, Vice President and Senior Manager, Government Relations, JPMorgan Chase & Co.; Roberto Llamas, Executive Vice President, Chief Human Resources and Community Empowerment Officer; Univision Communications Inc. 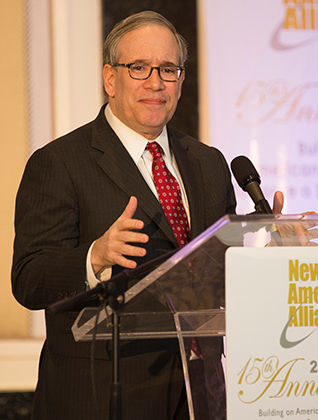 The day concluded with our 15th Anniversary Gala commemorating NAA's role as an advocate addressing critical issues facing the American Latino business community such as access to corporate and pension fund boards, greater availability of investment capital, and investing in education and mentorship for Latino students and entrepreneurs. 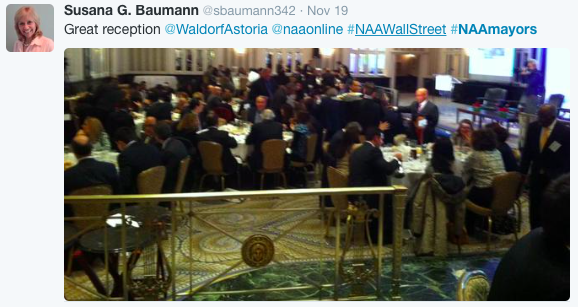 NAA Board members celebrated the NAA 15th Anniversary with a Brindis. 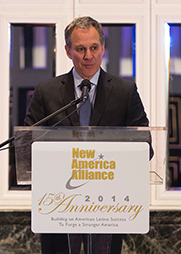 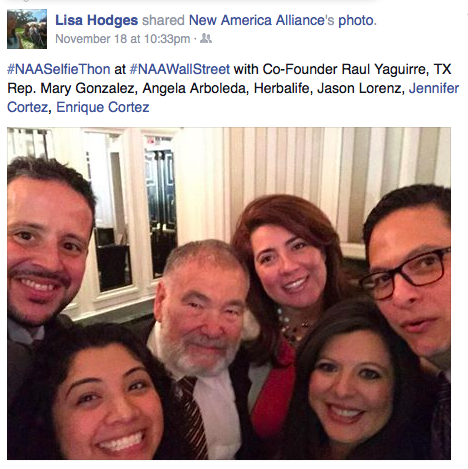 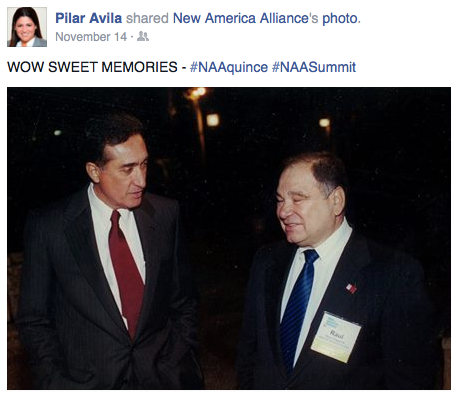 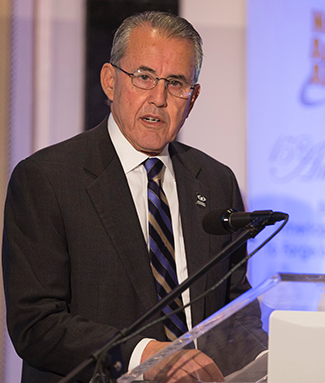 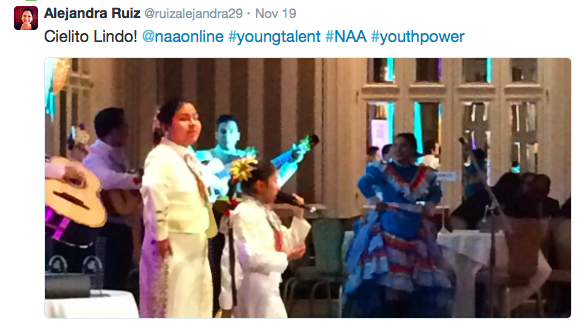 See message from NAA Co-Founder Raul Yzaguirre HERE. 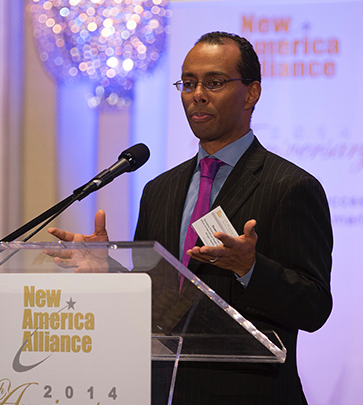 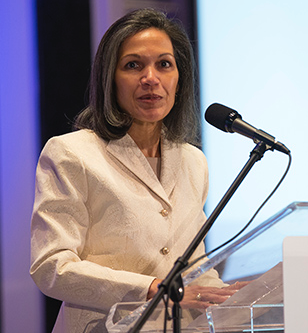 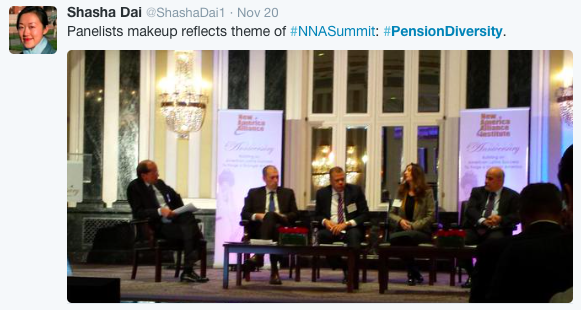 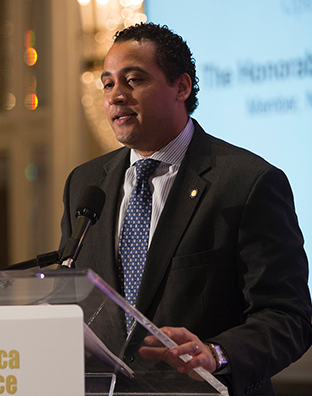 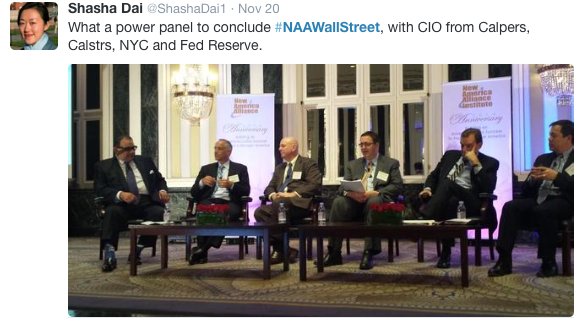 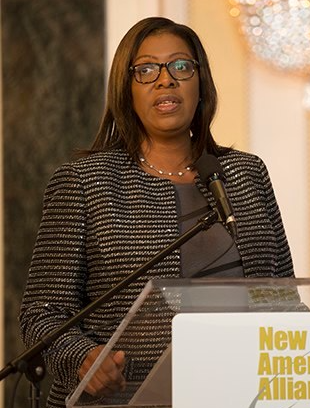 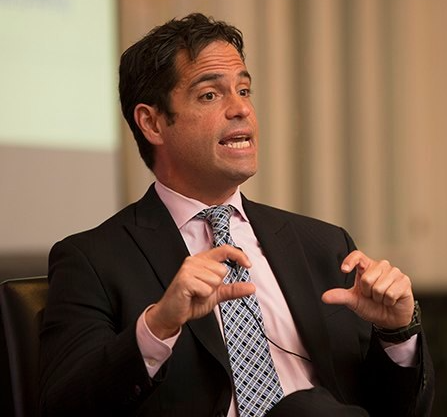 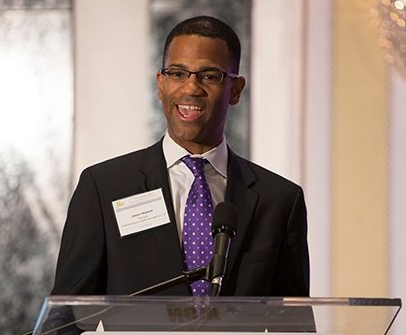 "We rather aim too high and have to settle for less, than aim too low and then try to reach for the stars"
NAA advocates for higher participation of Latino and diverse financial services firms in the institutional investor space, and once again featured Pension Fund Diversity Day for the closing of our Wall Street Summit. 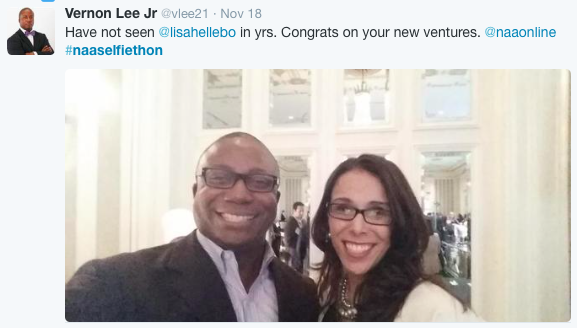 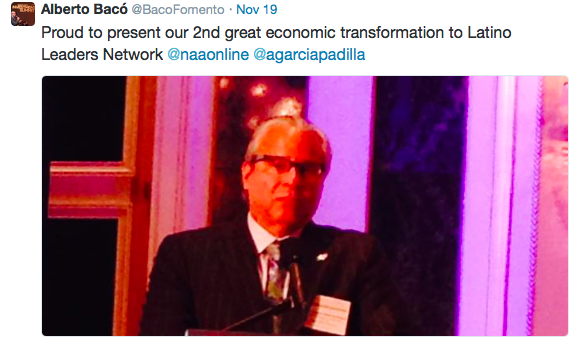 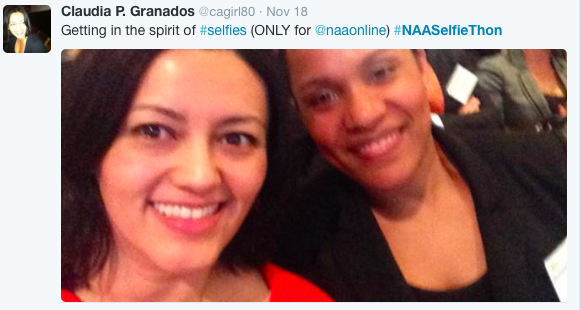 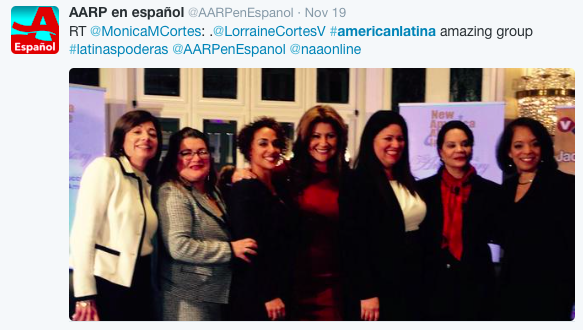 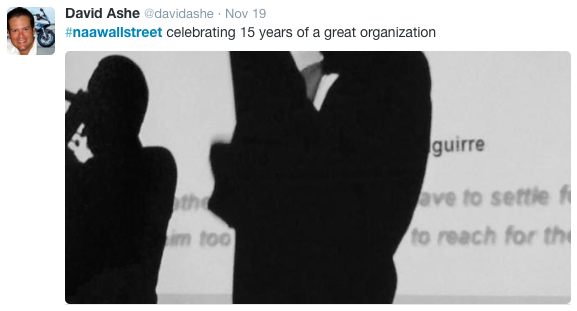 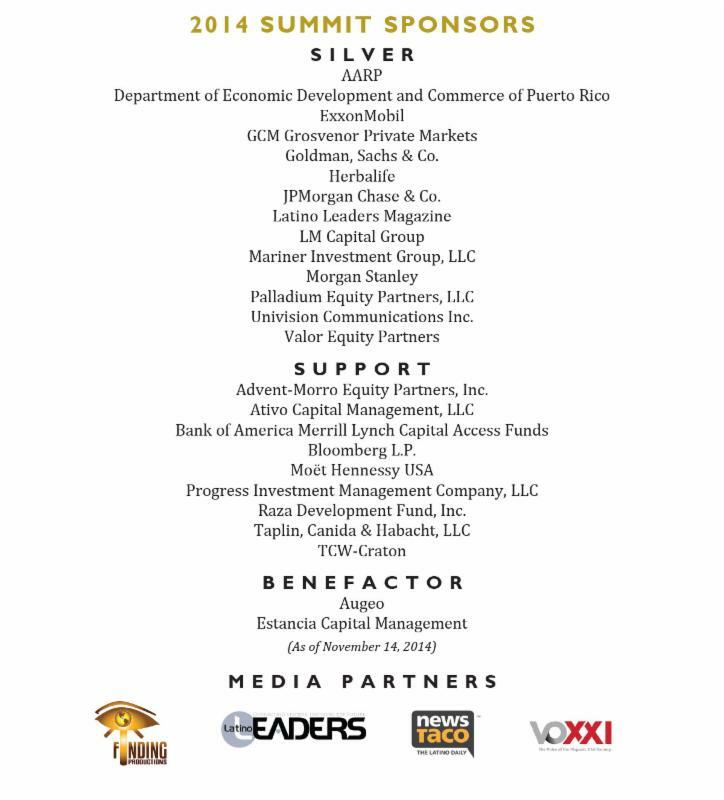 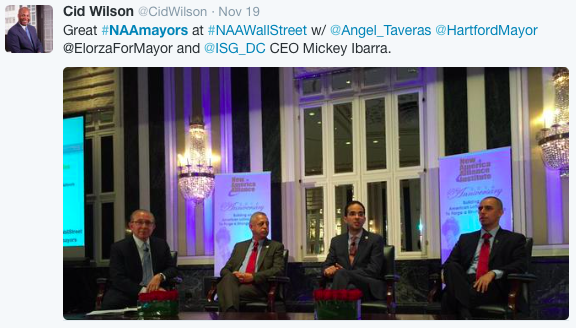 In 2003, NAA reported a total of approximately $500 Million of private equity capital managed by American Latinos. 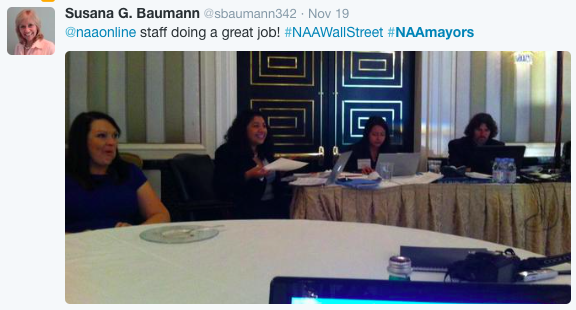 By 2014, NAA estimates total institutional assets managed by Latino and diverse firms within the NAA membership to be close to $25 Billion. 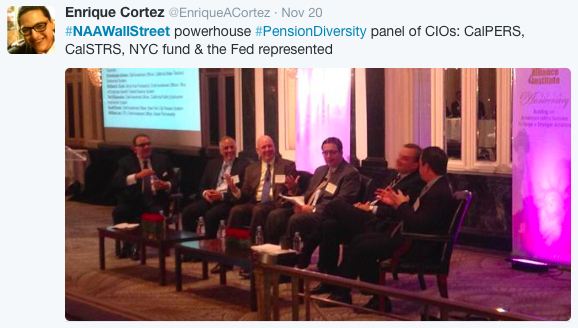 While this signals substantial improvement in the participation of Latinos in asset management, there is still significant advancement to be made as we consider the $33 Trillion pool of capital within the U.S. pension system. 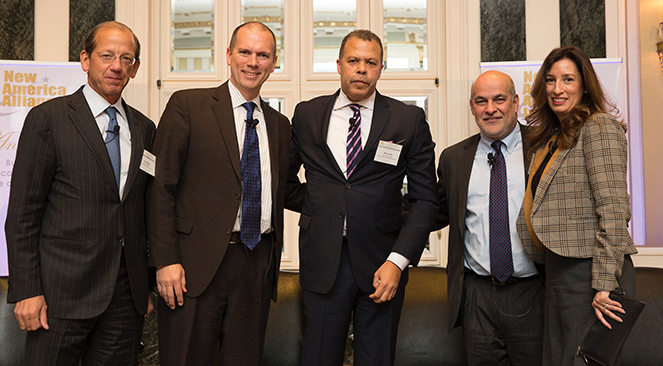 Diverse Investment Management - State and Outlook from Left to Right: Cyril Meduña, NAA Inc Vice Chair of Governance, Pension Fund Initiative Co-Chair & President, Advent-Morro Equity Partners, Inc.; Matt Hoganbruen, Managing Director, BAML Capital Access Funds; Derek Jones, Managing Director and Private Markets Investment Committee Member, GCM Grosvenor; Claudio Phillips, NAA Inc Board Member & Managing Principal, MB Global Partners, LLC; Ruby Muñoz Dang, Director of Marketing and Client Services, Garcia Hamilton & Associates L.P.
Lastly, we were delighted to induct six more members into the NAA 100K Club. 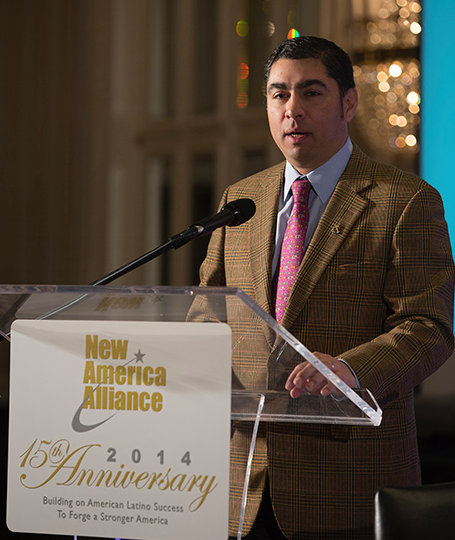 Tommy Espinoza, NAA Inc Board Member & President and CEO, Raza Development Fund, Inc.
Gilbert Garcia, CFA, Managing Partner, Garcia Hamilton & Associates, L.P.
Cyril Meduña, NAA Inc Vice Chair of Governance & President, Advent-Morro Equity Partners, Inc.
Nearly $5 million has been invested into NAA by its members in the 100K Club alone. 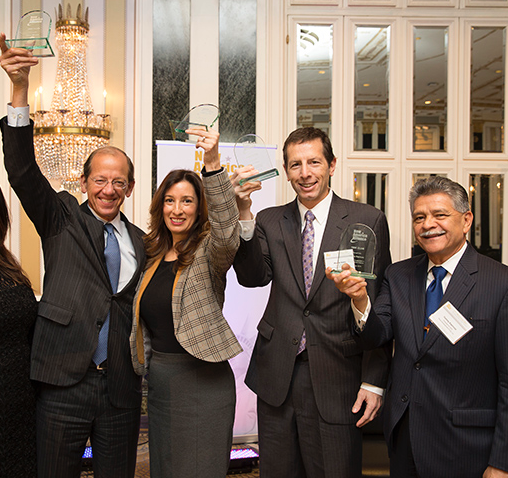 NAA 100K Club Inductees from Left to Right: Cyril Meduña, NAA Inc Vice Chair of Governance, Pension Fund Initiative Co-Chair & President, Advent-Morro Equity Partners, Inc.; Ruby Muñoz Dang, Director of Marketing and Client Services, Garcia Hamilton & Associates L.P.; Ricardo Bekin, NAA Member & Managing Principal and Chief Investment Officer, Ativo Capital Management LLC; Tommy Espinoza, NAA Inc Board Member & President and CEO, Raza Development Fund, Inc.